Chimichurri Sauce: In food processor, purée parsley, vinegar, garlic, shallot, oregano, hot pepper flakes, salt and pepper. Scrape down side of the processor with a spatula; pulse, slowly adding olive oil until well combined. Transfer sauce to resealable container; let stand for up to 2 hours. Mini Purple Peruvian Potatoes: Meanwhile, in large bowl, toss potatoes with Parmesan, olive oil and basil. Wrap tightly in foil; grill for 45 minutes over medium heat, opening foil up for last 15 minutes to crisp potatoes. Remove silver skin from petit tender and slice into 4 medallions. Season with salt and pepper; brush each medallion with 1 tsp (5 mL) Chimichurri Sauce. Increase heat to medium-high; grease grate lightly. Sear medallions for 2 minutes on each side. Reduce heat to medium; cook, turning, for 10 minutes or until internal temperature reaches 145°F (63°C) for medium doneness. Grilled Asparagus: Meanwhile, toss asparagus with salt, pepper and olive oil; grill for 6 to 8 minutes or until lightly browned and tender-crisp. Sprinkle with lemon juice. 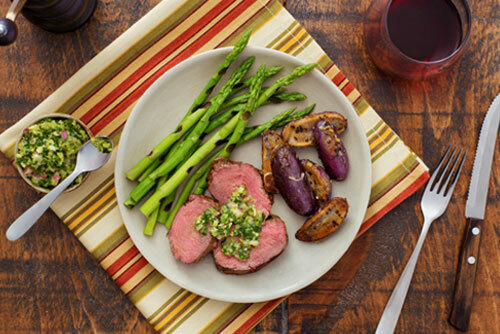 Serve medallions with Mini Purple Peruvian Potatoes, Grilled Asparagus and remaining Chimichurri Sauce. To remove silver skin, insert small sharp knife or boning knife under the tissue, about 1/2 inch (1 cm) away from the tip of the tender. Holding the detached silver skin, run the knife with the blade angled slightly upwards from the tip toward the other end of the tender. Repeat to remove remaining silver skin.